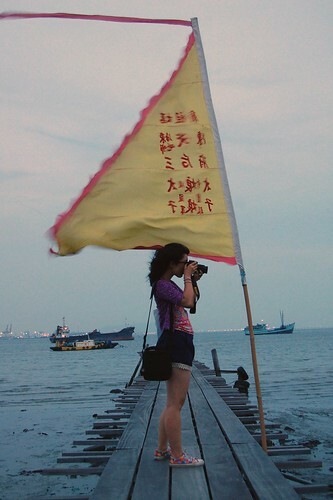 Georgetown, Penang was my last destination on our 6 month Asian backpacking trip in 2011. It was the fireworks ending to a life-changing trip. It left such a great impression on me- about the people, streets, art, food that I decided to visit again late last year. I even ended up staying longer than just the planned 1 week! What I adore about this place is the fact that it was fêted as a World Cultural Heritage Site in 2008 but remains to this day a bustling, living and breathing city. Life is nearly the same here as it was decades ago and perhaps that is why it's considered the most tourist-visited destination in Malaysia. 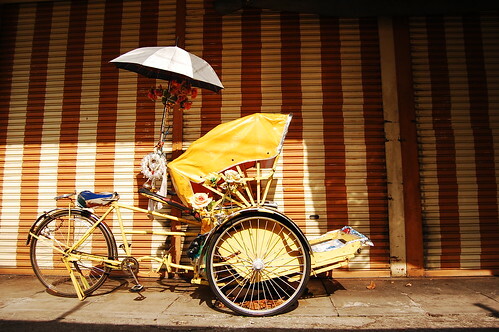 The inner city itself is pretty small and the streets are very navigable just by walking or riding on a rickshaw. But there were so many things to do here and little corners to explore. 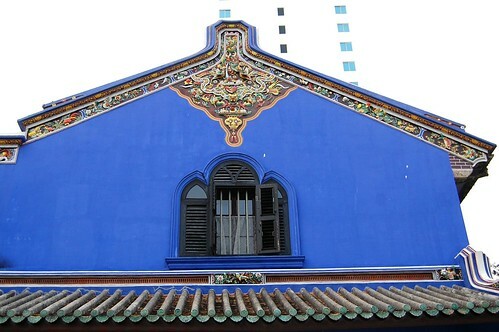 The Cheong Fatt Tze or Blue Mansion was built before the end of the 19th Century by a Chinese businessman and politician who has been dubbed the "JP Morgan of the East”. I went on an enlightening tour and was amazed at the unique architecture and design as well as the history of this place. 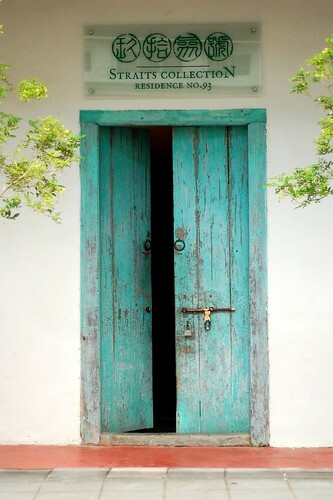 The Blue Mansion got its name from the crummy indigo exterior paint which washes off with every rainfall. But since the paint is organic, it helps preserve the façade by preventing cracks. The mansion is considered an auspicious spot because it was originally built with careful attention to the principles of Feng Shui. Many films have been shot here, including the 1993 Oscar-winning French film “Indochine” starring Catherine Deneuve. I love the rags to riches story of Cheong Fatt Tze. He came from a poor family and started working as a cowherd back in his village. In 1856, when civil war ravaged much of China, he was forced to migrate to South-East Asia to seek his fortune. He started as a water-carrier and then became a shopkeeper in Jakarta, Indonesia. After his marriage, he established a trading company with the help of his father-in-law. Gradually, he began to accumulate his wealth through hard work and perseverance. In 1877, he expanded his business from Jakarta to Medan. His business was based on agricultural products such as rubber, coffee and tea but he branched out to the financial sector by acquiring a bank. He became a very wealthy man. The Blue Mansion on in Leith Street is one of a few houses he had built all over the world and it still stands to this day as a protected heritage building. You can only enter the premises if you join a daily guided heritage tour of the mansion. It is conducted in English at 11am, 1.30pm and 3pm. The admission fee is 12 MYR per person. We discovered the Chocolate and Coffee Museum purely by chance as we were walking to our favorite roti place one day. A museum dedicated to coffee and chocolate? Seriously? Being coffee and chocolate lovers, we rushed inside. The museum part is quite small, only 52 sq m and you're taken on a guided tour of the origins of these 2 legal stimulants. The museum offers paintings depicting the history of chocolate and coffee, the process in making chocolate and coffee, their benefits and the history of the boutique. But the best part is the taste test! You get a bite of almost every chocolate flavor imaginable- even with durian, mango and chili! My favorite was this dark chocolate blend that's to die for! I can't imagine that you will get out of that place without buying anything. They also let you taste durian coffee and the famous Penang white coffee. Plus an assortment of teas and hot chocolate. After a total choco coffee overload, we stepped out to enjoy some durian ice cream. Notice the lack of photos? I was too busy chomping on chocolate! 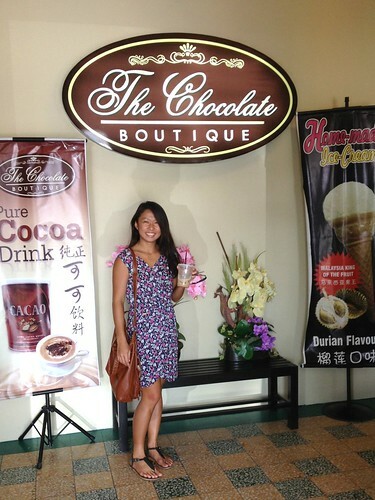 The Chocolate & Coffee Museum is located at ‘The Chocolate Boutique’ on 22 Leith Street, Penang. My friend Noel of Wander 2 Nowhere was the one who tipped me on this. He said go walking around and look for all the street art that strewn all over town. He showed me a few photos that convinced me to go street art hunting. 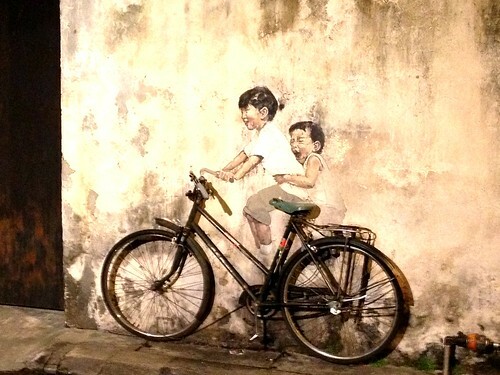 What makes them unique is that they are painted into walls of old buildings and most of them have items like an old bicycle or swing set that are integrated into the image. Try it yourself and see how many you can find! 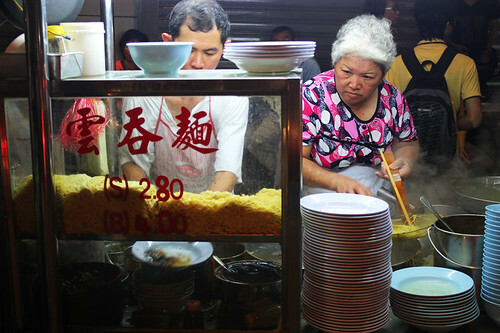 Now the food, that's the highlight of Penang! Wait until around 6PM when the food sellers start setting up shop. 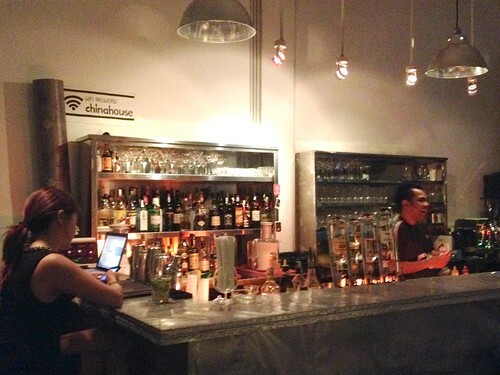 There are several places all over Georgetown but our favorite was the roadside cluster on Chulia Street. 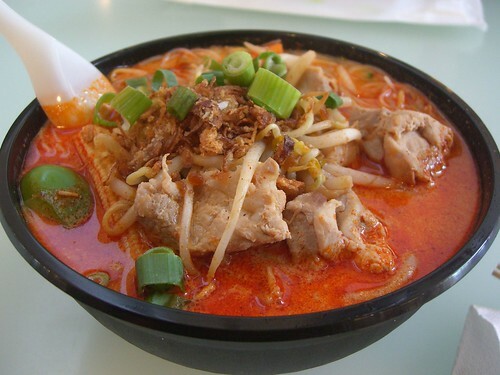 Assam laksa is thick rice noodles, vegetables, spicy mackerel based soup with generous amount of shrimp paste. Its main distinguishing feature is the asam or tamarind which gives the soup a sour taste. Cendol is one of Malaysia’s favourite desserts. 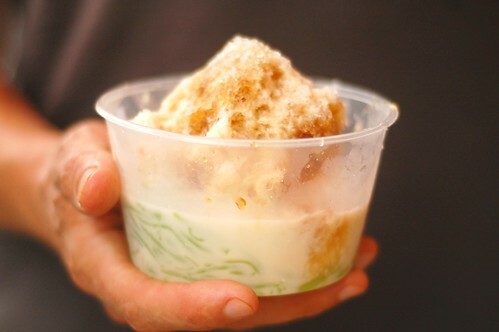 It's a delicious mix of shaved ice, fragrant coconut milk, green starched noodles with pandan flavouring and aromatic palm sugar from Melaka. A perfect treat on a hot humid day in Penang! 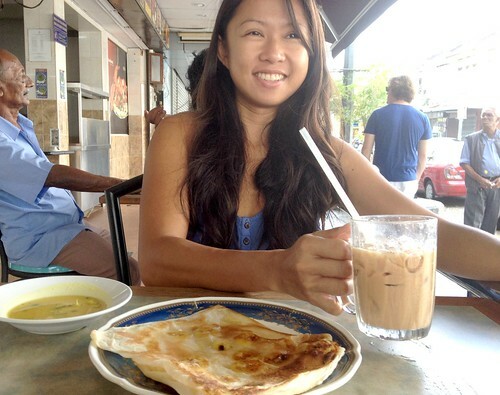 Banana roti makes a delightful breakfast and is the Malaysian version of the banana pancake. It's made from stoneground wholemeal flour which is cooked with banana, rolled up, cut in squares and drizzled with condensed milk. I could eat more than 2 of these in one sitting! And don't forget to enjoy copious amounts of iced coffee and teh tarik, or Malaysian pulled tea while you're enjoying the street food! 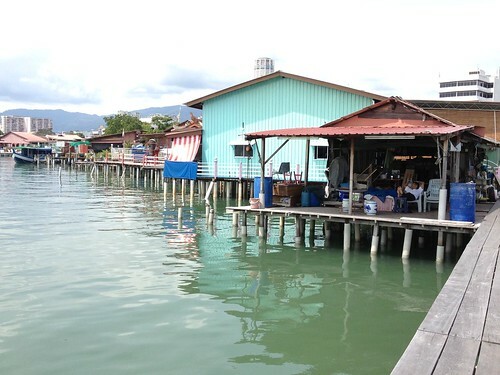 The first time I got to explore these wooden houses on the water, it was sundown. I walked across wooden planks to see little kids on bikes, dogs behind low gates and grandmas sharing the day's gossip. I walked until I reached the edge and saw a couple of boys with fishing rods. I said hello but they were too shy to talk to me. I later learned that these Weld Quay Clan Jetties have been in existence for over 100 years, and are home to small clans of Chinese origin who built their homes on stilts above the water. There were threats of demolition but Georgetown's UNESCO World Heritage status saved these jetties from destruction. There are a handful of restaurants around and I had some delicious seafood from what at first appeared to be a residence but turned out to be a small family-run restaurant. After my meal, I looked through souvenir shops and small shrines. 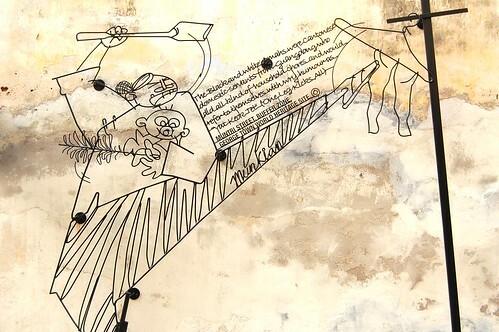 It's surprising how these clans have been able to preserve their way of living for so long! Imagine a traditional compound of 3 heritage buildings, linked by an open air courtyard and converted into 14 spaces comprising shops, cafes, restaurants, galleries and a multi-purpose performance theater. You could spend hours in here not run out of things to do! We started with a meal at a restaurant that happened to have a library corner. Then we checked out the bar to have dessert and a few drinks. They had a mouth-watering selection of fruit pies, cakes and cookies. 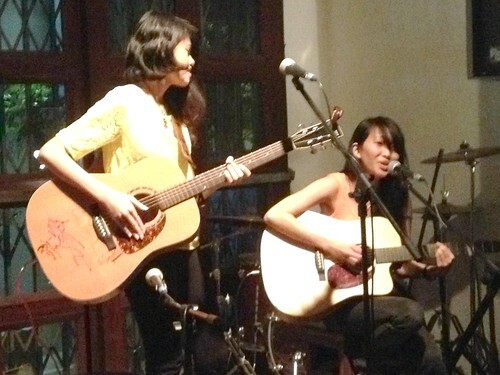 We were just in time to watch a live acoustic performance which was really fantastic. Then we walked upstairs to check out an ongoing exhibit by a sketch artist. The night wasn't over yet as we kicked back a few more drinks over a few games of billiards. It's always been a little wish of mine to stay at antique shop house in Georgetown and it finally happened last year. We got to stay at the Straits Collection which is a company that manages residences in antique Chinese Shop Houses located in the core zone of UNESCO Heritage Georgetown, Penang. We chose this lovely duplex on 93 Armenian Street which is one of my favorite streets in Penang because of the street art, colorful shops and artsy cafes. 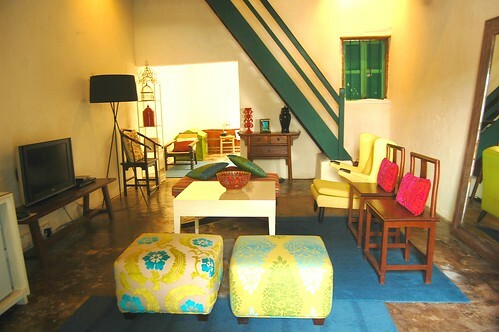 These teal wooden doors open up to a lively and tastefully decorated living room downstairs. It leads onto an indoor courtyard with antique style wooden bath. Such a treat especially when they throw in some aromatherapy shampoo and soap that you can enjoy. 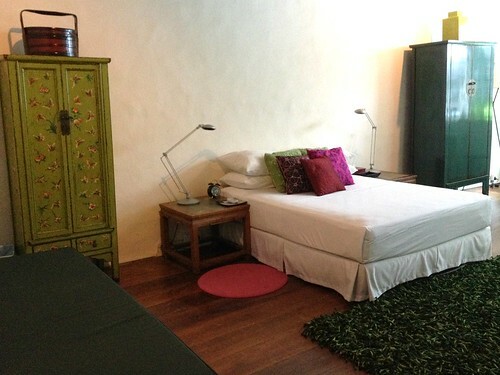 Upstairs is one large bedroom with desk, daybed and a queen size bed decorated in same style and same bright colors. The outdoor area has an open plan bathroom. It was amazing to stay at a building so rich in history and detail and yet enjoy modern amenities like Cable TV, Air Conditioning, WiFi, Rain Shower, Mini Fridge & Tea/Coffee Facilities. They also offered full housekeeping service. 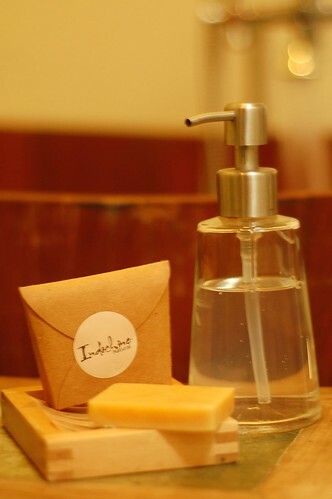 What made the experience just so luxurious were the little touches that the staff had placed all over the rooms. A couple of oranges on a platter. An assortment of fruit and herb teas. Freshly ground coffee with a french press. Milk and some sweet treats in the fridge. A couple of sarongs that you can lounge around in. Books on Penang and some fashion magazines. Everything was so well thought of! At the rate of 670 MYR net per night, it's certainly not an everyday experience. But it was a wonderful indulgence to cap our brief stay in this enchanting little corner of the world. - Check out budget flights to Kuala Lumpur via Cebu Pacific Air or Airasia. -The fastest way to get to Penang from KL is to book a flight which is offered by Airasia or Firefly. If you're lucky, you might score some cheap flights. But generally this is the most expensive option but it does saves you a few hours of travel time. - Taking the train is another option to go from Kuala Lumpur to Penang. There are two trains a day on this route. The first one leaves at 16:15 and arrives at 22:00, while the second is an overnight train that leaves at 21:35 and arrives at 05:30 the next day. The station at Penang is called Butterworth. If you’re traveling to George Town, you’ll need to get the ferry once you get off the train. The trip takes about 6 hours. You can purchase train tickets from KL Sentral. - The least expensive option is to just take a bus to Penang at the Puduraya terminal. 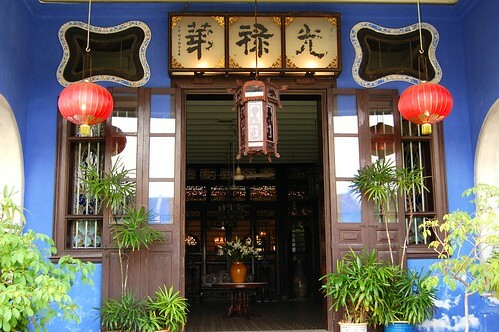 - As mentioned in the article, we stayed a night at Straits Collection in an antique China shop house. There are plenty of less expensive accommodations all over the city. 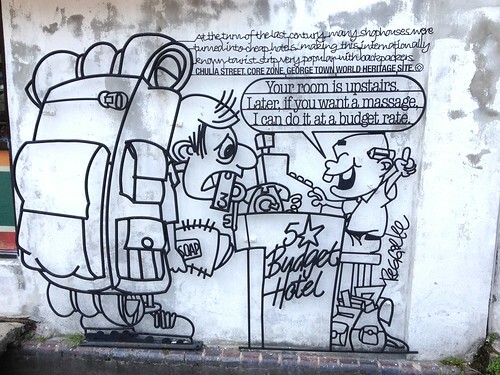 For budget options, you might want to check out Tune Hotels Penang or Roommates Dorm Hostel. - Filipinos get a free 30 day visa on arrival upon landing in Malaysia. 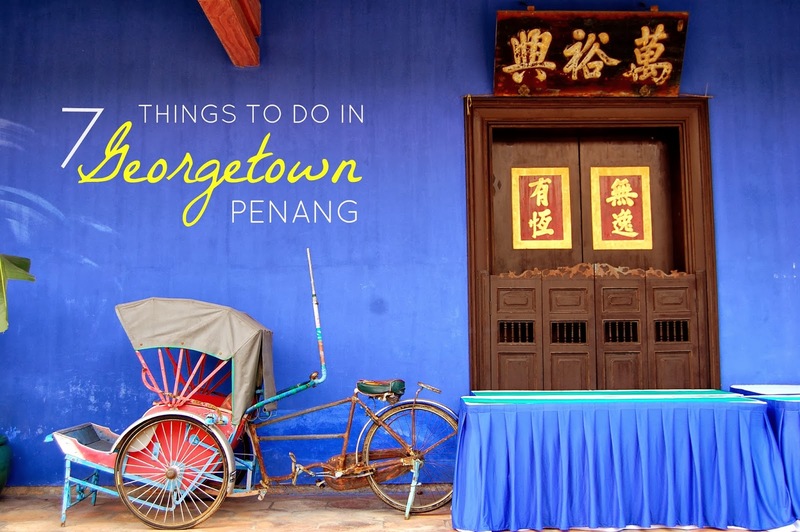 Have you been to Georgetown, Penang before? Can you add to our list of things to do or places to see? Share your picks on the comments below! I'm sure you've been here already Atty. Oman? Share your things to do naman! Great post! Check out these 6 Amazing Travel Experiences in Penang or 13 Penang Hawker Foods and Nonya Restaurants that You Must Try while in Penang!